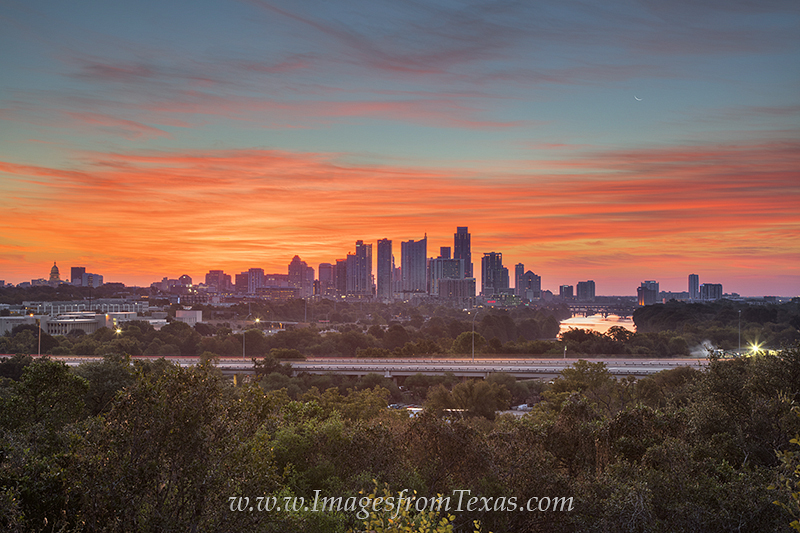 Looking east toward the downtown Austin skyline on a beautiful October morning, the sky is filled with brilliant reds and oranges as the sun begins to make its way to the horizon. This cityscape captures most of Austin’s most prominent buildings, including the Texas State Capitol, the Austonian, the 360 Condos, and also shows Lady Bird Lake. Looking east toward the downtown Austin skyline on a beautiful October morning, the sky is filled with brilliant reds and oranges as the sun begins to make its way to the horizon. This cityscape captures most of Austin’s most prominent buildings, including the Texas State Capitol, the Austonian, the 360 Condos, and also shows Lady Bird Lake. Photo © copyright by Rob Greebon.